Running is in my DNA. My Dad is a runner and inspired me to start running when I was a 6 years old. I ran my first race when I was 7 . I have never stopped, competing through college and running 44 marathons, including 15 Boston Marathons, qualifying for all of them and marathons in 24 USA states. I love running and share my passion with others, volunteering as a coach, coaching with Team In Training and Boston Fit, I'm a pace setter for Beast Pacing.I am an ambassador for Orange Mud trail running gear. Running permeates every aspect of my life - I’m a Mom… my daughter is seven and ran her first race in 2014. I’m a sister…my twin sisters are also accomplished runners. I’m a Bostonian…I have run 15 Boston marathons and wont ever stop. I’m a friend…I have built lifelong friendship over miles of training. I’m a business owner… I own a day care and manage an ice cream shop, both in my hometown Belmont MA!! I’m every runner…a real person that faces the challenges of everyday life, while making time for my the sport that I am so passionate about. 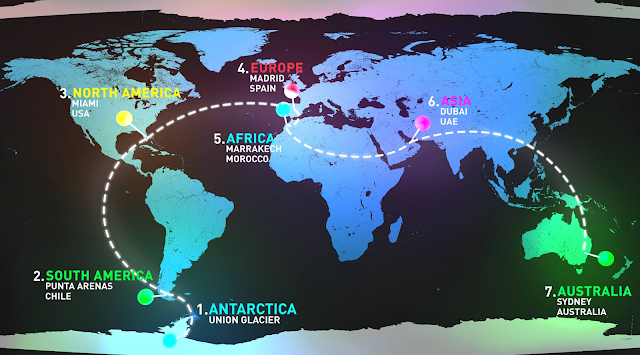 When I learned about the World Marathon Challenge, I immediately wanted to compete in this event in 2016. This event is 7 marathons, 7 days, 7 continents. The physical and mental demands of this race will be an awesome test of endurance. I will be the first American woman to complete the challenge and attempt to break women’s record time of 40:22:25. I have the drive to complete this race and I have the best resources in the world (cardiologist, nutritionist, coaches etc). It would be incredible to have you support me on this journey in which I have already been training for since January. I am committed to giving 200 percent. It would be my honor to represent the USA and become the first American female to run this race. My daughter Taylor told me I can so this, so it must be true. Thank you Orange Mud for keeping me hydrated, and to my friends at Newton sneakers for supplying my sneakers. Ultima Replenisher took me under their wing and agreed to sponsor me, a dream come true! The race director, Richard Donovan accepted my application and saved me a spot while I get organized! This race and representing USA as the first American female runner to run this, means everything to me. But above all, I am doing this to inspire people! Thank you to my friends who have heard me talk about this race for countless hours and to my family, this would not be possible without your support. Im truly very lucky to have so much love in my life.